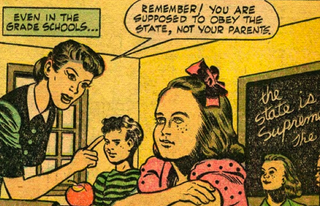 In 1947, the Catechetical Guild Educational published Is This Tomorrow: America Under Communism, a propaganda comic classic about the impending Sovietification of America. According to the comic, Communist saboteurs would maintain dissident camps in Alaska and North Dakota. This comic was marketed as an educational book by Catechetical, which was founded by Father Louis Gales to distribute comic books with Catholic themes. An estimated 4 million copies of Is This Tomorrow were distributed in the late 1940s. The book tells the story of a Red sleeper cell that takes over America after a nation-crippling drought. The saboteurs place agents in the media, foment racial unrest, take over Congress, brainwash schoolchildren, and rig elections. It's not always the most gripping or sophisticated read, but it's an intriguing artifact of Cold War anxiety. You can read the whole tawdry tale here.